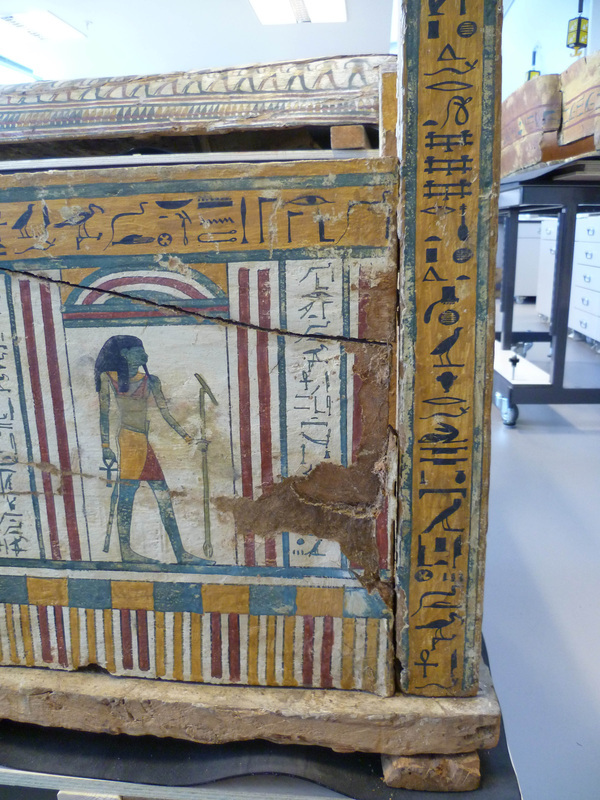 The object is a wooden coffin, surfaced with gesso, and painted in polychrome. I worked on this object from Oct-Nov 2011. Measures 2140mm long, 750mm wide, 800mm high. The coffin I worked on is the outer base part of a nest of coffins with mummy. 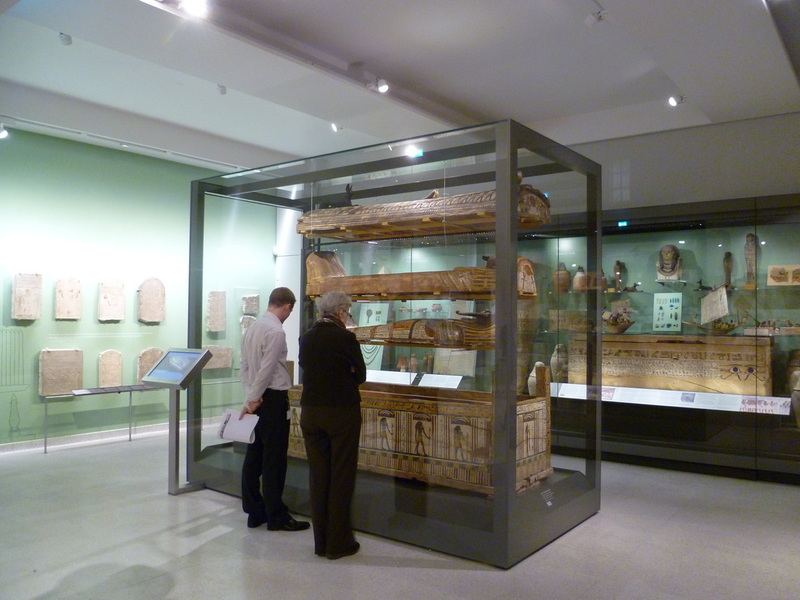 It is one of the centre pieces of the Egyptian Galleries of the Ashmolean Museum, opened in Nov 2011. It dates to the 25th dynasty (c. 1080-650 BC) and belongs to a priest called Djeddjehutyefankh, whose tomb was excavated by Naville at Deir el-Bahari at the end of the 19th century. The inner coffins are anthropomorphic, and the outer one is rectangular with a post at each corner and vaulted lid, typical of the 25th dynasty. 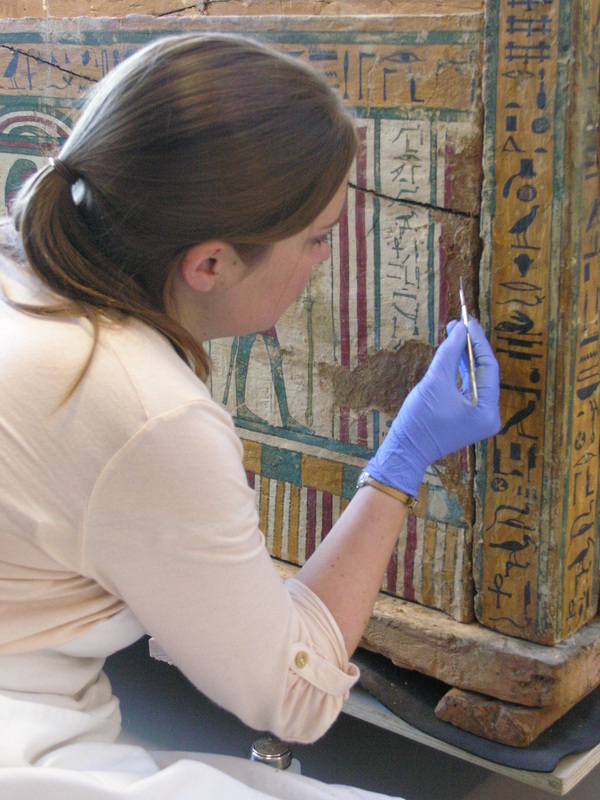 Previous conservation work on the coffin to stabilise edges and fill gaps with AJK (Avlar(polyvinyl acetal)-jute-kaolin) dough had left disfiguring areas that the conservators at the Ashmolean wished to reverse before the coffin went on display. The dough had affixed some of the gesso/paint edges such that flakes had been pulled away as the object moved due to environment or handling. 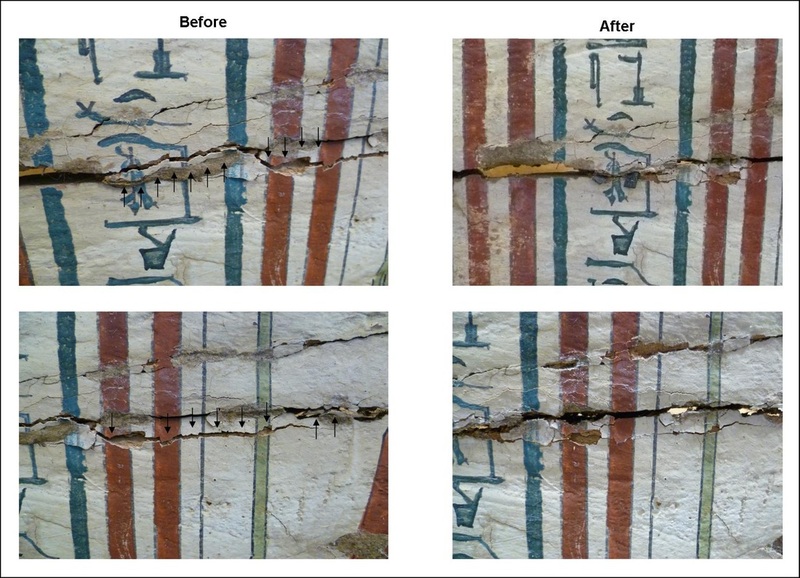 The aim of the treatment was to improve the appearance of the coffin for display and stabilise damaged gesso/paint edges. Apply acetone to the AJK dough until it softens. Consolidate mud plaster and fragile wooden areas with Lascaux 4176 (Medium for Conservation) or 1-2% w/v Klucel G in 50:50 IMS:distilled water, or Lascaux 4176 mixed with Lascaux 498HV (approx 1:3 by volume). The choice of consolidant depended on the accessibility and visibility of the area to be consolidated, and the strength of consolidant required. Stick back pieces of gesso/paint that have detached with Lascaux 498HV. Fill voids with a putty made of 15% w/v Klucel G in 3:2 IMS:acetone with paper pulp, coloured to resemble wood/mud plaster with raw sienna and burnt umber dry pigments. This fill was decided upon after experimentation with various adhesive/bulker combinations. Cover AJK fills that have been left in place and new Klucel/pulp fills with spider tissue held down with 5% Klucel G w/v in 3:2 IMS:acetone; paint with Lascaux acrylic colours. 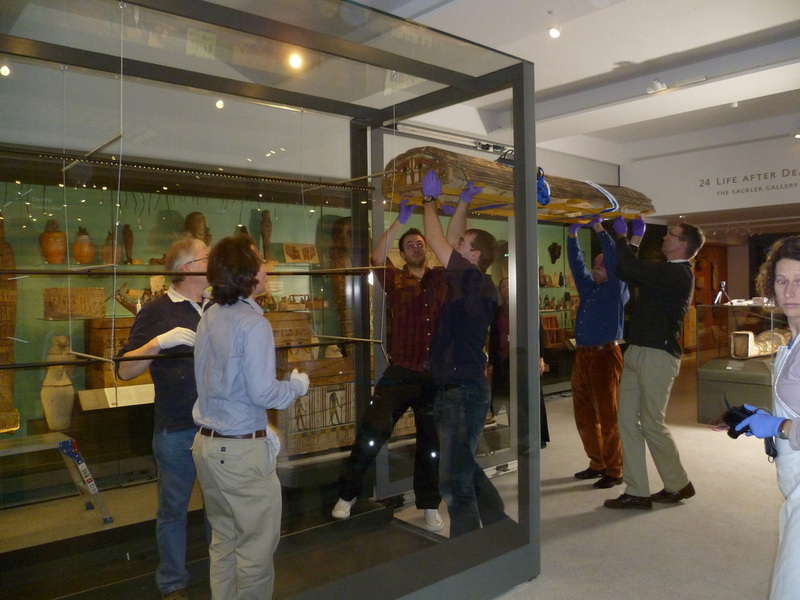 The nest of coffins was installed in a large free-standing case in the gallery. The lids balance on stainless steel frames, which are held aloft by steel bars suspended on chains from the top of the case. To move the lids into position, they were strapped to their steel frames and lifted by hand onto the bars.